It was a beautiful fall day here in DFW. The inside of the house was a pleasant 75 degrees Fahrenheit all day, the AC not running at all. We don’t get too many opportunities to throw open all the windows here in the metroplex, so I took advantage. Few clouds in the sky, the sun shining bright, and I was treated to lunch by a friend, as thanks for a favor I was happy to do and expected no recompense for. Some good family time at dinner helped to wrap up a beautiful day. Koyono has announced some new iPod cases, hand-crafted by the leather goodsmen of Orbino. I especially like the brown, embossed crocodile skin Cambino case for video iPod models, seen here. I’ve been using a Koyono ViewSlimmy as my main wallet for several months, and I love it. Great build quality, and it’s holding its own in day-to-day usage. I would expect much of the same from these iPod cases. I also have my eye on their BlackCoat Minimal, which, oddly enough, is not available in black. Originally uploaded by Pieter Pieterse. You’ve heard the expression, “hot enough to fry an egg”. 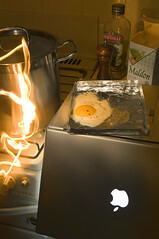 Pieter Pieterse decided to do exactly that, whipping up a little breakfast poultry with his MacBook Pro. Remember when your parents told you to behave or else you would find nothing in your stocking at Christmas? Ever wanted one of those hollowed-out books holding a gun or money or some other treasure, like in the movies? Make your own with these instructions. Change iTunes 7 to look have more of the Aqua interface found in iTunes 6. Shouldn’t everyone have access to clean water? Jeff notes Dean Kamen’s latest venture, which sounds fascinating, and it reminded me of Blood:Water Mission. Blood:Water Mission was started by Jars of Clay, as a result of a visit Dan Haseltine, the group’s lead singer, made to Africa. Its mission is to combat the spread of HIV/AIDS by providing clean blood and clean water, digging 1,000 wells, and providing medical facilities to treat the sick. All Blood:Water Mission is asking for is a simple, one-dollar donation per person. The new technology Dean Kamen is working on will help untold thousands, perhaps millions, but it’s not available yet, and won’t be on a massive scale for a while. In the mean time, please consider a donation to Blood:Water Mission or a potable-water charity of your choice. ISBNSPY.com – Is it cheaper on Amazon.com? Enter an item’s ISBN to see how the price compares to Amazon’s. Simple interface for those with web access on their mobile phone. Space Invaders Wrapping Paper | Uncrate. Something tells me women will just roll their eyes because they don’t get it, but if you give this to any guy, he’ll love it. Warning: adult language on page linked above.